I know we have to process the wood we harvest as much as possible before we export it, but do we have to build factories to do it where they can be seen from the most accessible summit in the World Heritage Area? 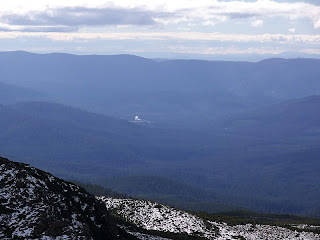 We try to encourage tourists to come here, then we stick a new factory on the edge of the WHA where its buildings and especially its smoke emissions are visible from the Hartz Mountains. Bonus! This is Newood, formerly Southwood (note the url, they changed the name because of the original bad publicity. The website seems to be a little out of date), built near the Huon River to process timber from the nearby forests in various ways. It's supposed to have a wood-burning power plant eventually, I bet that'll make it even more attractive. As it is, it stands out very clearly against the backdrop of forests.